You’re pulled in a thousand directions. You can focus on things that you want to happen, what’s happening right now or what’s happened in the past. What gets to claim your focus? Where should you spend your energy? Develop a habit of appreciating what you have. Focus on the joy of what you *do* have in this very moment. Your thoughts, your attitude are things you can control. Use them to positively shape your experience. If you continually focus on what you can’t control and what’s missing in your life, you will create a void that isn’t meant to be there. By focusing on what you lack, the void will grow. The quality of your life stems from the meaning you give your circumstances. If you’re never satisfied with what you have, you’ll never lead a life of satisfaction. If you only long for what’s around the next corner, you’ll end up continually disappointed. Choose to be grateful, for your life takes on whatever meaning you assign it. Your quality of life flows from how you choose to experience the circumstances. If you feel down today, arrive at a new meaning that all this was meant to be. 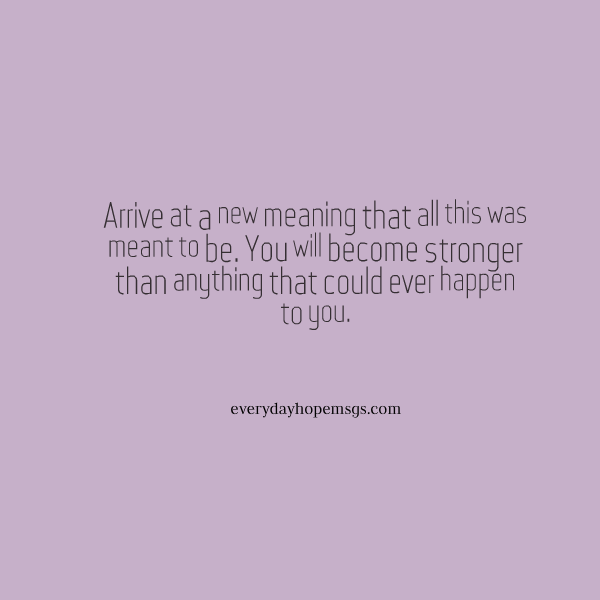 In doing so, you will become stronger than anything that could ever happen to you.